I have two sets of these (total of 8 skewers for this recipe) and have used and reused them for several years. Easy dishwasher clean up. I've tried many grinders through the years, and these are simply the best. There's an easy dial for adjusting the grind from fine to coarse, and they look nice on the table, too. They come filled with sea salt crystals and peppercorns. I used this for coating the potatoes with olive oil. I like this silicone brush so much better than the traditional kind. It works well and is a breeze to clean in the dishwasher. These work great for scrubbing potatoes, carrots, and other root vegetables so their nutrient-rich skin is clean enough to eat. These pads are flexible enough to get into every nook and cranny as you scrub. Of course, they're great for scrubbing pots and pans, too. Easy, nutritious, delicious, and no kitchen heat! 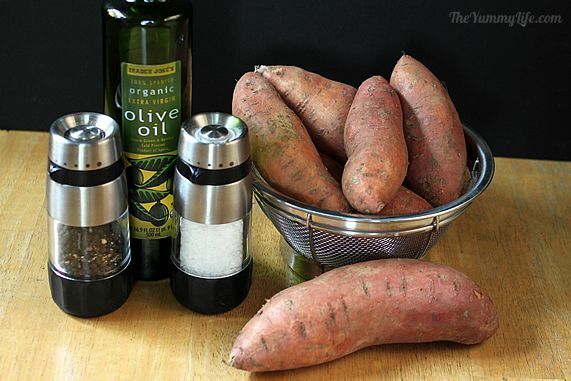 This is a fast, easy way to cook sweet potatoes without heating up the kitchen. 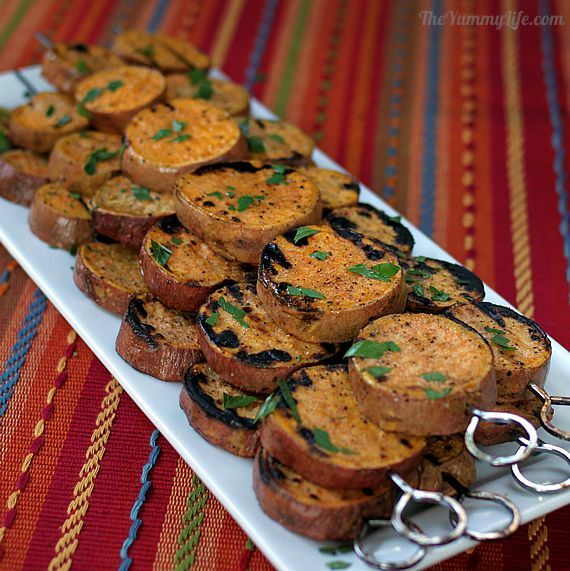 They're a flavorful, healthy accompaniment to any grilled meat. You will need eight 15" metal skewers (or equivalent). Bamboo skewers are not recommended because they are difficult to pierce through the hard potato slices. Slice potatoes into 1/2" thick rounds, discarding ends. 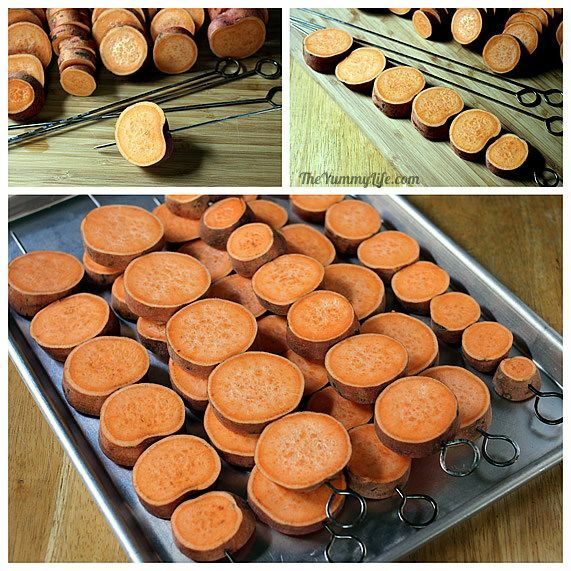 With potato slices laying flat, thread each one all the way through the diameter onto metal skewers. Use a twisting motion as you insert the skewer to help it cut through the potato. Brush each skewer of potatoes lightly with olive oil and season with salt and pepper (plus additional seasonings, if desired). Turn over each skewer and repeat oiling and seasoning on other side. Over medium heat, grill potato skewers for approx. 7 minutes; there should be a few visible grill marks. Flip skewers over and grill approx. 7 minutes more until soft all the way through when pricked with a fork. 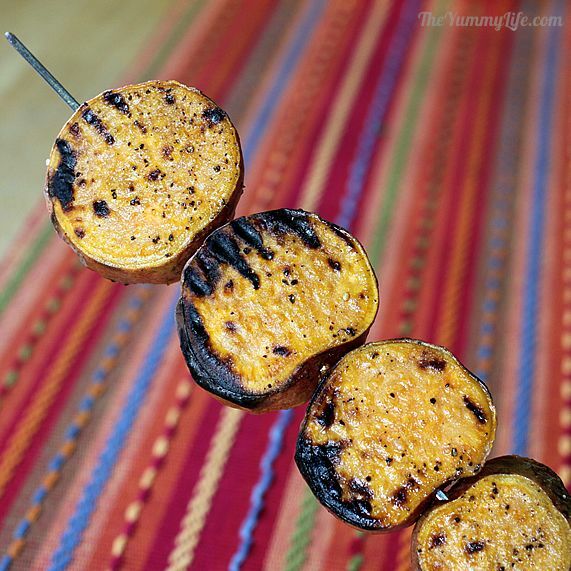 Cooked sweet potato kebabs may have a dried out appearance, however they are moist inside and taste good. You can brush them again lightly with olive oil just before removing them from the grill to eliminate their dry appearance. This makes for a prettier presentation, if desired. Garnish with chopped fresh herbs, if desired. Serve warm or room temperature. 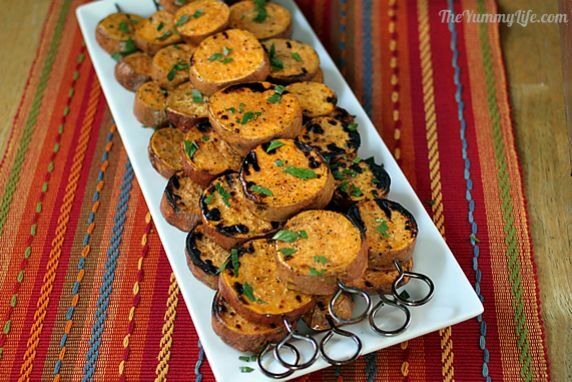 Gone are the days of sweet potatoes only appearing on Thanksgiving tables. With increasing awareness of their versatility, great flavor, and nutritional benefits, sweet potatoes are showing up in many forms on home and restaurant menus. #1 Veggie for Nutrition! 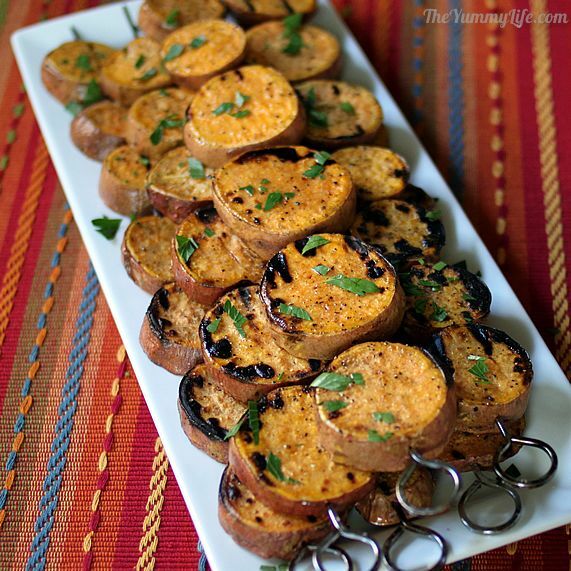 That's right, sweet potatoes are one of the most nutrition-packed veggies you can eat. In fact, nutritionists at the Center for Science in the Public Interest (CSPI), ranked sweet potatoes #1 for overall nutrition above all other vegetables. 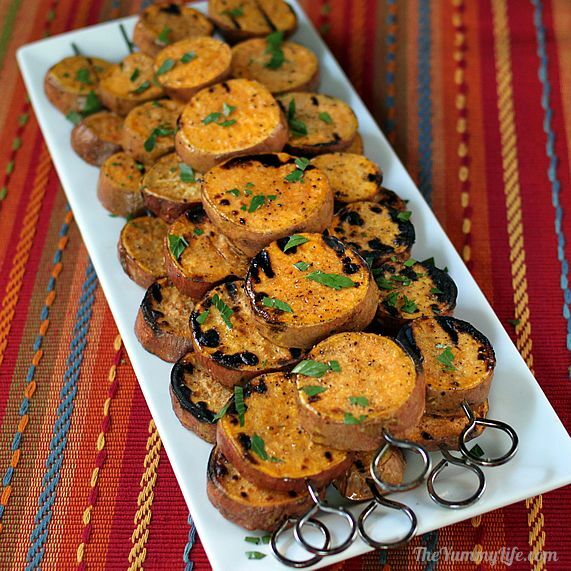 They have a low glycemic index, making them a much healthier choice than regular Idaho spuds. Sweet potatoes are a complex carbohydrate loaded with Vitamin A (in the form of beta-carotine), Vitamin B6, Vitamin C, and fiber. They are rich in antioxidants, potassium, and iron. Beat the heat and use the grill. In cold weather months, I most often roast sweet potatoes in the oven. The method I'm sharing today is my favorite way to enjoy them in hot months. Cutting the potatoes into slices of even thickness makes them cook quickly and evenly, regardless the size of the potatoes. They taste so good with that grilled flavor, and they don't heat up the kitchen. Eight 15-inch metal skewers (or equivalent). Bamboo skewers are not recommended because they are difficult to pierce through the hard potato slices. 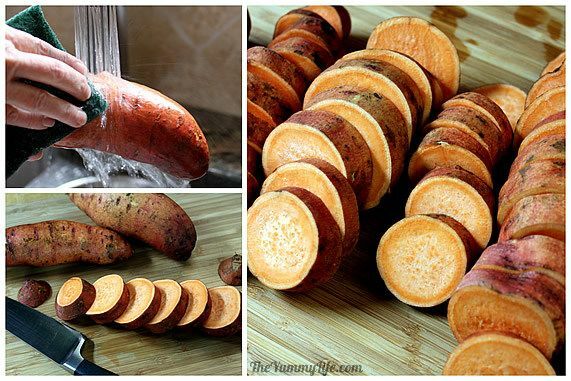 Sweet potatoes. I prefer to use organic ones so that I don't have to peel them. There's added nutrition and fiber in the peel. Salt and Pepper. Freshly ground is best. Additional spices are optional. Sticking with just salt and pepper tastes great; however, you can season these potato slices with anything you like. Consider cumin, cinnamon, cayenne, chili powder, garlic powder, or other preferred spices. Chopped fresh herbs for garnish are optional. If you have some handy, they add flavor and make the presentation prettier. Consider sprinkling any of these on top: parsley, mint, thyme, dill, sage, basil, or other preferred herbs. Step 2. Scrub and wash the potatoes well. If you aren't using organic potatoes, peel them, too. Step 3. Slice the potatoes into 1/2" thick rounds. You can discard the pointy end pieces. Step 4. Pierce each flat slice with the skewer all the way through the diameter. Use a twisting motion as you insert the skewer to make it easier to pierce the hard potato. Fill each skewer with slices. By the way, there's no need to double skewer the potatoes to keep them from spinning when you turn them on the grill. That is sometimes necessary with softer veggies like zucchini. But, potatoes are dense enough that they don't move much when you flip them on the grill. Mine always flip over easily. Step 5. Brush each slice lightly with olive oil. Season with salt, pepper, and any other spice that meets your fancy. I usually just stick with salt and pepper. Flip them over and oil and season the other side, too. Step 6. 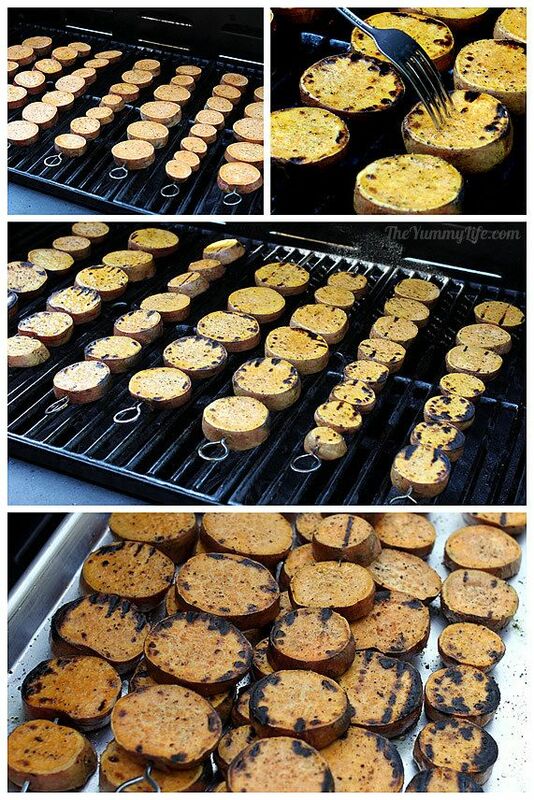 Heat the grill and add the sweet potato skewers. They cook quickly--approx. 7 minutes on each side. Pierce them with a fork to make sure they're soft all the way through before removing them from the grill. If they start looking a little dry, you can brush them lightly with olive oil again right before taking them off the grill. Done! Those charred grill marks add yummy flavor to every bite. Serve them as they are, or sprinkle on some chopped fresh herbs, if you like. I've sprinkled some chopped Italian parsley on mine. These are so easy to serve when they're skewered like this. They're good served warm or at room temperature. 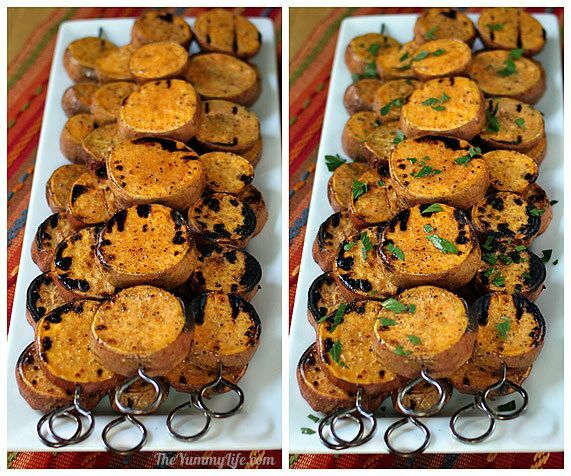 Can "regular" spuds be grilled this way, too? Absolutely! 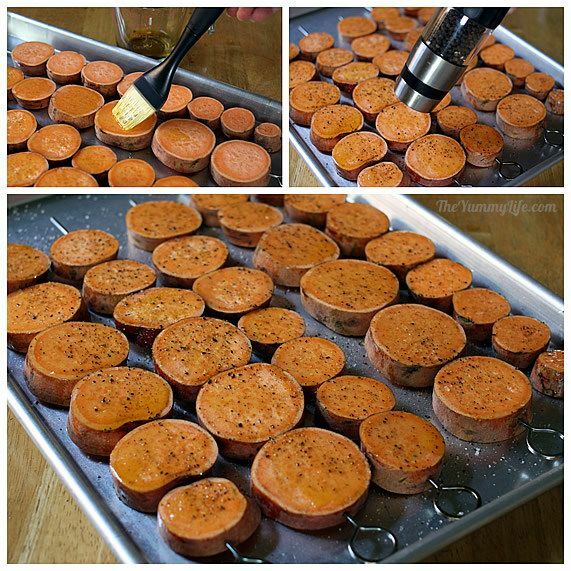 Use the exact same procedure and ingredients--just switch out the sweet potatoes with Idahos, Yukon Golds, or any kind of potato you like.